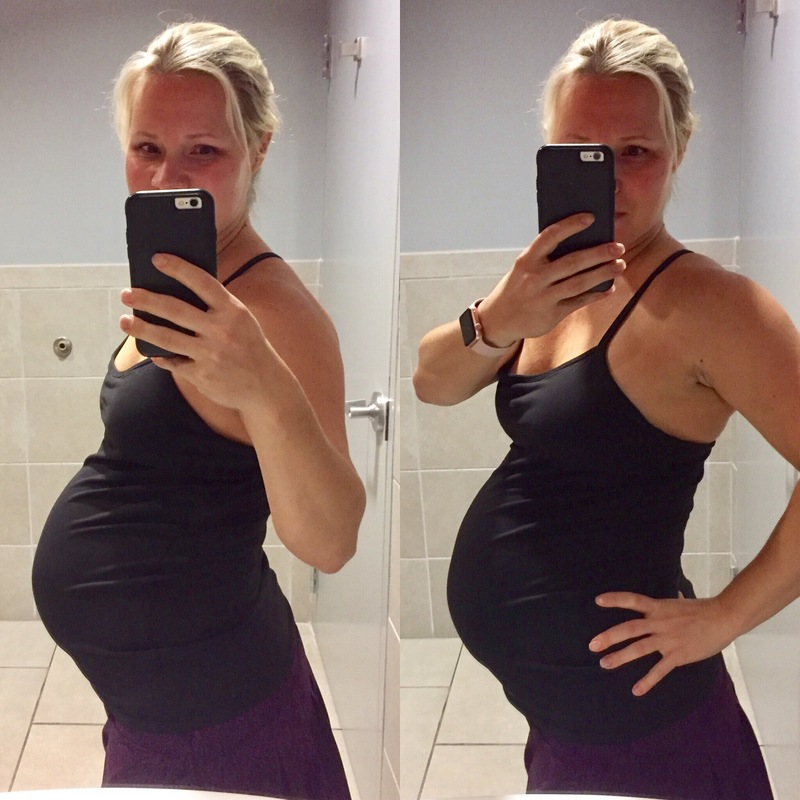 How far along: 28 weeks…hello 3rd trimester! Only 12 weeks left!! Weight gain: At my 4/24 appointment I had gained 22 pounds, so I’m guessing around 25 right now?? All I know is that I went back and checked my pregnancy update around this time with AW and I had only gained 14 pounds. Yikes! Maternity clothes: Loving them. There’s a small handful of non-maternity clothes I can still wear, but that’s dwindling. I’m doing lots of sun dresses this go around. I’ve been burning up lately, which is weird because I am usually always cold. I had Asher Wade right before the weather warmed up, so this is all new for me. Thankfully work has a pretty casual dress code. I’m literally wearing a tank top and linen pants that are borderline pajama pants today. Sleep: It varies, but for the most part sleep isn’t great. I’ll have a good night, and then several not so good nights. If I fall asleep and stay asleep all night, I’m good, but if something wakes me up I’m screwed and generally cannot fall back asleep. There have been several nights where I’ve just turned on my Kindle and started reading at like 2 a.m. because I’m wide awake. I also tend to wake up well before the alarm goes off. Movement: It’s really picked up a lot lately, and I’m noticing more BIG movements in there. A lot of the time it feels like he’s repeatedly tapping me from the inside, like he’s playing the drums or something. I’m also feeling him roll over and flip around, which almost takes my breath away. Exercise puts him to sleep for awhile. Cravings: Nothing out of the ordinary. Still loving sweets (all the cake). Also craving protein. I love to have anything cold, like fruit (especially pineapple), frozen yogurt (I’ve even been sticking a Chobani Greek yogurt in the freezer for an afternoon snack most days) and popsicles. I’m eating a lot of cereal for dinner as well. Lunch tends to be my most well rounded and filling meal of the day. I’m not overly hungry in the evenings and like to just snack or have cereal. Aversions: Not really anything in particular, but there are a lot of times where things that I normally love, just don’t sound good at all. I feel like I rotate 10 or so things, and I’m pretty content with that. What I miss: Wine and sleeping on my belly. I’ve treated myself to my allotted 4 ounces twice so far and it was fabulous. I also miss being able to jog outside, or even walk more than 10 minutes for that matter, without the stupid pain in my ankles and shins. And I miss being able to get dressed and put my shoes on with minimal effort! What I’m looking forward to: No change from last time…I’m so ready to have a weekend at home where we have nothing on the agenda so we can get some things done! We have had such a busy spring and I’m so ready for some downtime so I can start “nesting.” We have everything for the nursery and now we just need to pull the room together and put on the finishing touches. I still need to pull out all of Asher Wade’s baby clothes, wash and sort, and figure out what else we may need. I also still want to do some major deep cleaning throughout the house. There are several other house projects I want completed before D-Day as well. We have another busy weekend coming up, but then I am hoping to slow down and start focusing on baby prep. And rest. Lord knows I need to rest. Also excited for Mother’s Day this weekend. Oh, and Matt and I have a little getaway planned for the end of the month! Definitely excited to lay by the pool and relax for a few days. Best moment of the week: I’ve really loved the increase in movement I’ve noticed this past week. It really is one of the coolest things about pregnancy. Thoughts on pregnancy: It’s funny how much more I get stopped this pregnancy compared to last time. I literally have people stopping me in the hallways at work, at the store, definitely at the gym, and really anywhere out in public, just to say something sweet about my belly. There’s been a lot more belly rubbing this time, which doesn’t bother me at all, but it’s kind of funny. People just seem to love a pregnant person!